Lots of new features were delivered this year! In case you missed anything, we invite you to explore this 2016 Year in Review. 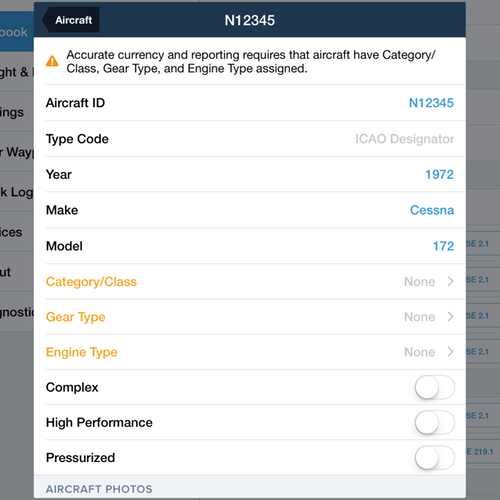 The theme of ForeFlight 8.2 is to enhance core app features. Aeronautical Maps, Alerts, Garmin connectivity, and Logbook all received development love. Download ForeFlight 8.2 now on the App Store! We compiled your feedback and delivered the top items you wanted to see in our global data-driven Aeronautical Maps. Data additions include altitude markers for Class B, C, and D airspace, ARTCC frequency stamps, Class E surface areas, Mode C rings, Special Airport Traffic Rule (SATR) areas, U.S. ADIZ, and Terminal Radar Service Areas (TRSAs). 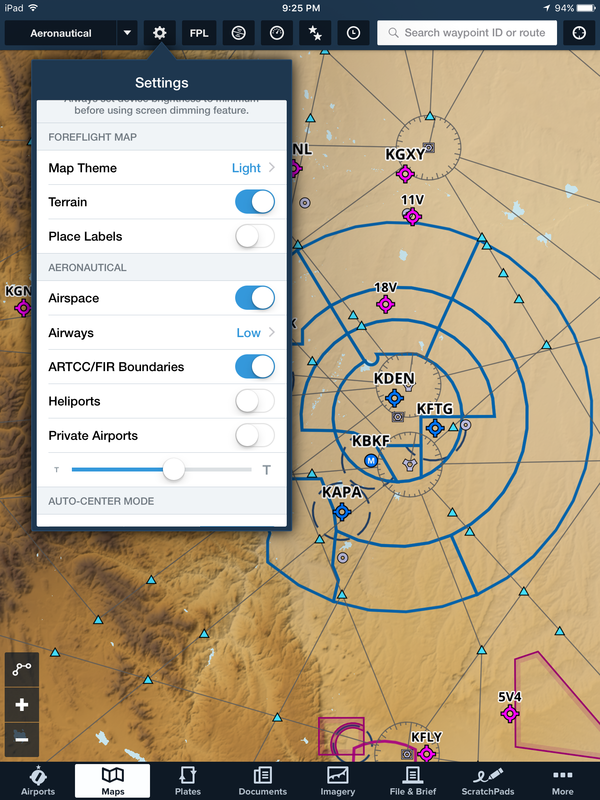 Explore the Map Settings menu for more options to customize the Aeronautical Maps layer; for example, to turn on and off airport and airspace types. For customers who fly outside of the U.S., you can access airspace details when you tap-hold on an airspace outline and then select the All tab at the bottom of the pop-up. Tap on an item in the pop-up window to highlight it on the map. 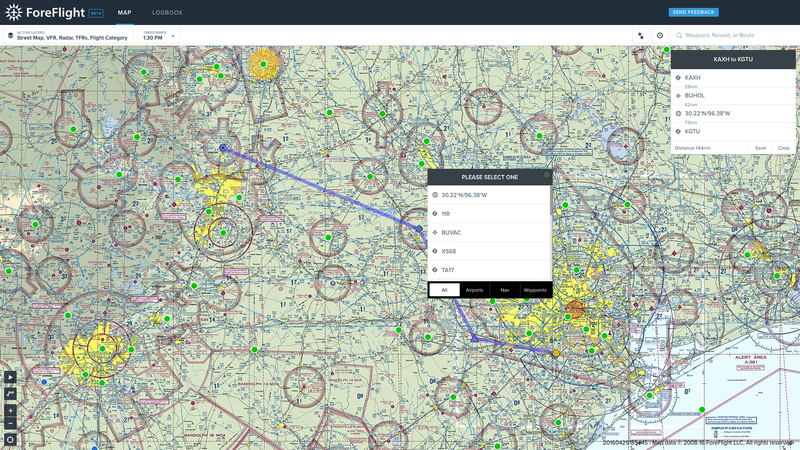 Left: More options to customize the Aeronautical Maps layer in the Map Settings menu; Right: Tap-hold on airspace outside the U.S. for more details. The same incredibly fast rebuilt map engine and stunning data-driven Aeronautical Maps you enjoy in ForeFlight Mobile have landed on the web. ForeFlight’s Continuous Zoom technology smoothly declutters the map as you zoom in and out, and provides essential aeronautical information with a single click of the mouse. All of your work syncs instantly from the web to mobile, giving you the flexibility to plan on the desktop and in the cockpit. Log in to foreflight.com with your ForeFlight Mobile credentials and start your next flight plan on the web. Better in-flight situational awareness is a major theme for us, and we continue that theme with three new safety alerts. Manage Alert settings by navigating to More > Settings > Alerts. The Sink Rate Alert activates when your descending vertical speed exceeds 4,000’ per minute for more than 5 seconds while flying above 2,500’ AGL. Below 2,500’, the vertical speed required to activate the alert drops to 3,000’ per minute and gradually lowers along with the altitude, down to 1,500’ per minute at 500’ AGL and below. The 500’ AGL Alert triggers when you descend below 500’ AGL. To prevent the alert from repeating it is only shown if you have previously been above 1,000’ AGL. Finally, the Runway Proximity Advisor, an alert which lets you know when you’re approaching and entering a runway, now includes both the name of the runway and the length remaining in feet, rounded to the nearest hundred. This alert is a helpful final cross-check that you are lined up on the correct runway. You can manage all of the Alerts in ForeFlight in More > Settings > Alerts. Whether on the runway or in the sky, these alerts provide critical information when you need it, and add to ForeFlight’s lineup of helpful safety features. 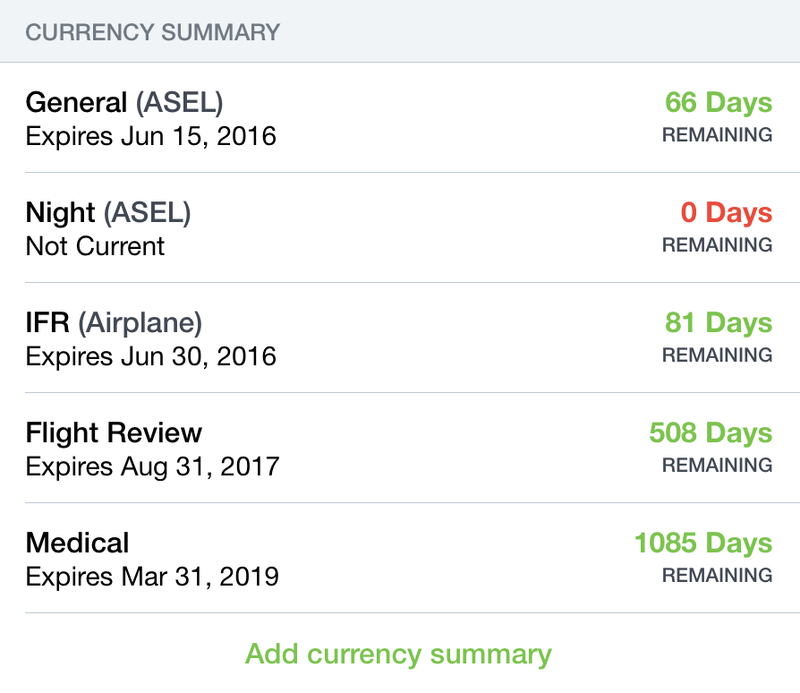 The color-coded Currency Summaries in ForeFlight Logbook are an excellent way to stay on top of certificate expiration dates, flight currency requirements, or flying goals. Because most of the Currency Summaries rely on complete aircraft profile information to accurately reflect status, Logbook will now flag any missing details (like category, class, or gear type) when you add an aircraft to a flight entry. An orange alert marker appears next to the aircraft, signaling that you need to add information. When you tap into the profile, the fields with missing information are also highlighted in orange to make it even easier. A new integration with Sporty’s allows you to receive certificates and endorsements in Logbook for completing Sporty’s online flight training courses. Login to the Sporty’s online training portal to link your ForeFlight account. Now you can quickly look up and select your departure and destination airports when you fill out your flight entry. Start typing an airport name, identifier, or city to auto-populate a list of available options. Your recent and favorite airports are also listed for easy access. Just one more way to make flight logging easier and faster! ForeFlight now supports the Flight Stream 510, Garmin’s latest addition to their Connext product line. The Flight Stream 510 connects to your iPad or iPhone via Bluetooth, enabling ForeFlight to receive GPS data, ADS-B weather* and traffic, and attitude data, as well as two-way flight plan transfer between ForeFlight and the GTN 650 and GTN 750 series navigators. Learn more about connectivity with Garmin avionics at foreflight.com/garmin. *Please note that satellite weather from the GDL69 through the Flight Stream 510 to ForeFlight Mobile is not currently supported. You can now add your FAA-registered call sign to your flight plan form. This new field appears underneath the tail number field and is transmitted to ATC in place of your tail number when you file (your tail number is automatically added to the Remarks section of the flight plan so it’s available to ATC). If you leave the call sign field blank, the plan will be filed under the aircraft’s tail number. Looking for the perfect holiday gift for your pilot-friend or flight instructor? ForeFlight Gift Certificates are now available! Click here to purchase. 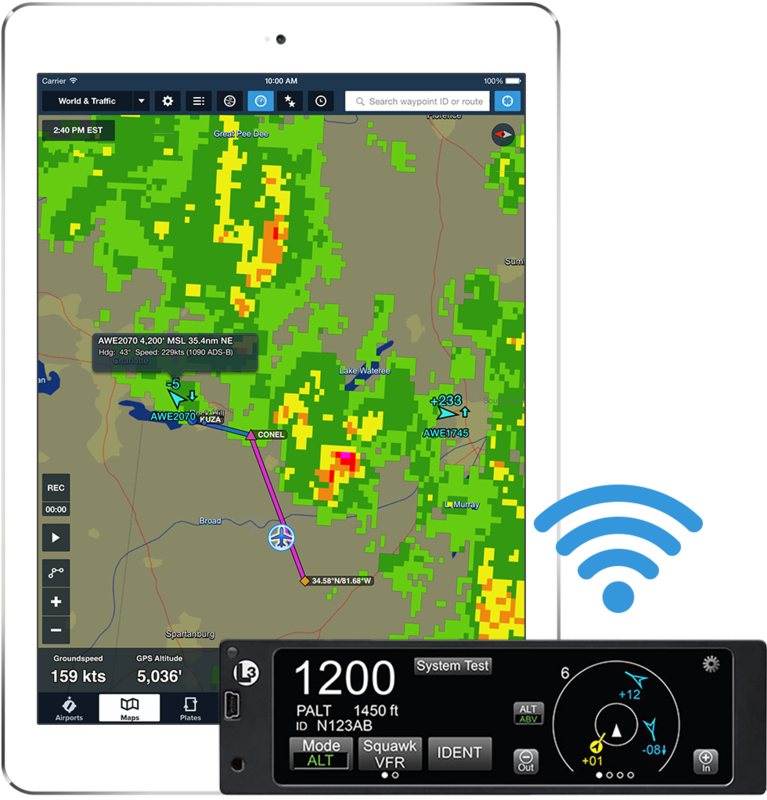 With ForeFlight 8.1 we introduce support for SiriusXM’s powerful SXAR1 Aviation Weather Receiver, which supplies ForeFlight with high resolution radar with storm cell attributes and tracks, lightning, METARs, TAFs, AIR/SIGMETs, TFRs, and more. 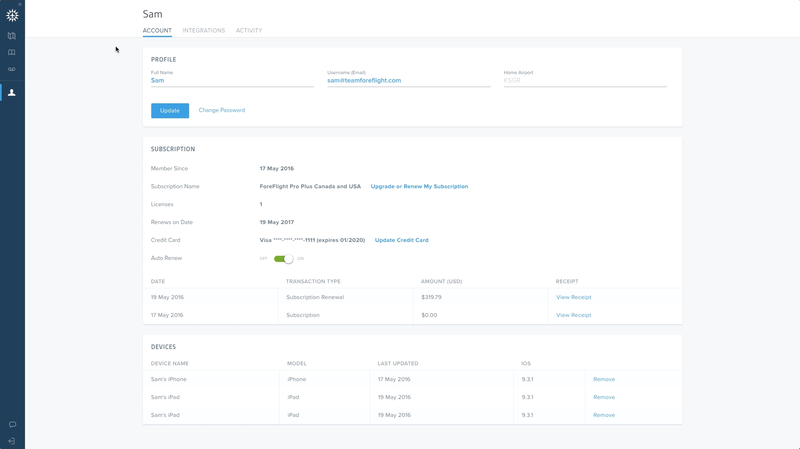 In addition, more of your logbook data is now in easy reach with Currency Details and access to Custom Field data in Reports. Download ForeFlight Mobile version 8.1 in the Apple App Store today! We’re excited to announce that we have partnered with SiriusXM to offer a portable XM weather solution to ForeFlight customers in the form of the SXAR1 Aviation Receiver. This compact, lightweight device wirelessly delivers a wide range of XM weather products to ForeFlight Mobile, including both composite and lowest-tilt NEXRAD radar, storm cell attributes like echo tops and tracks, AIRMETs and SIGMETs, TFRs, METARs, TAFs, winds aloft, and more, as well as GPS position. Future updates will unlock even more capabilities that will continue to make the SXAR1 a powerful inflight weather solution. 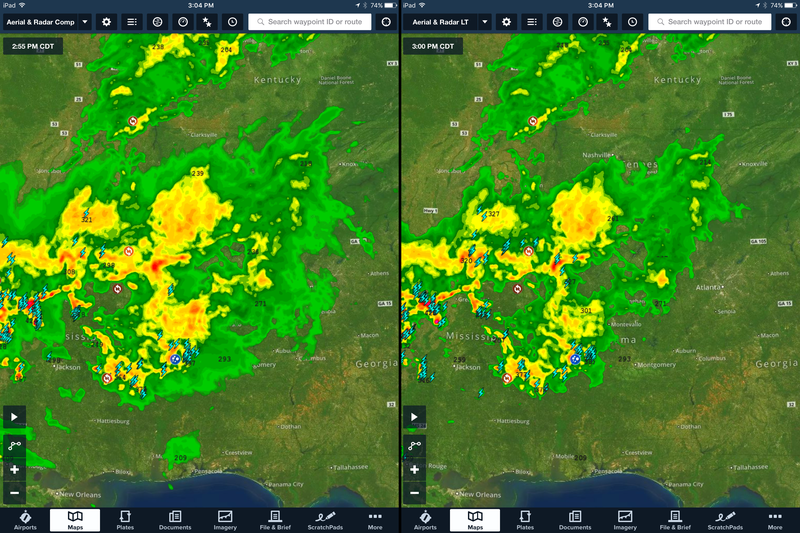 Check out Scott Dennstaedt’s article for some great insight and tips for using SiriusXM weather inflight. Because it receives weather information from satellites, the SXAR1 bypasses many of the limitations affecting the delivery of FIS-B weather. The SXAR1 provides nationwide weather with no coverage gaps, minimum altitudes, or line-of-sight restrictions – all it needs is a clear view of the sky. The built-in rechargeable battery and Bluetooth connectivity eliminates the need for wires in the cockpit. 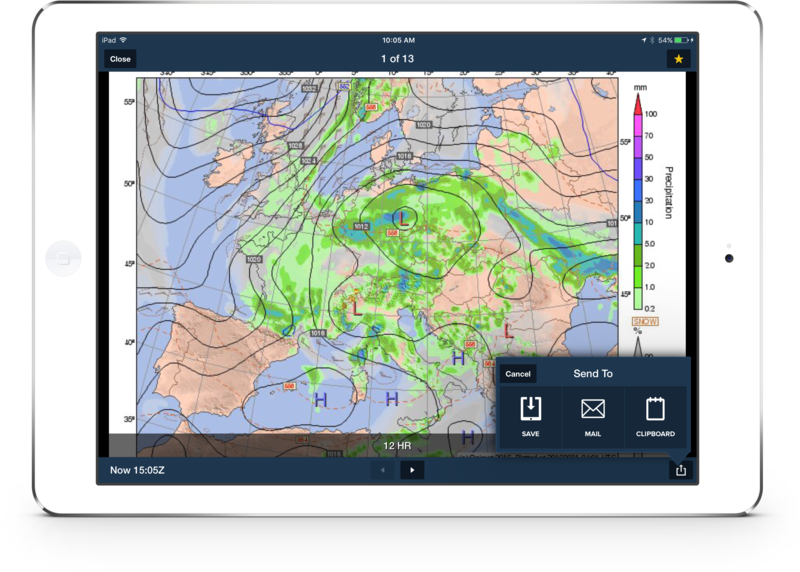 Coinciding with ForeFlight 8.1, SiriusXM is introducing the new Pilot for ForeFlight weather subscription package specifically designed for this integration. SiriusXM is also offering a $200 savings to pilots who buy the SXAR1 and activate the new subscription package. ForeFlight Logbook continues to improve with new ways to access important flight data. Tap on Currency Summaries on Logbook’s main view to see in-depth information about which flights contribute to each currency type, and a brief description of the requirements for each currency type. Access to this neatly organized information makes it easier than ever to understand your currency and stay on top of it. Logbook experience reports were also upgraded to include Custom Field data. Aggregated totals from any custom fields you’ve added to your logbook now appear at the bottom of experience reports. Click here for the latest information regarding ForeFlight Mobile and iOS 10 compatibility. 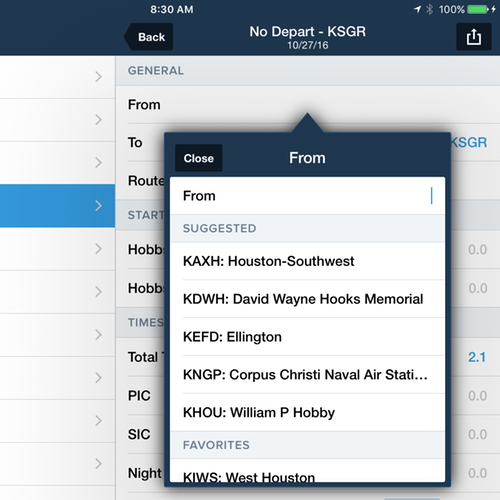 The wait is over—ForeFlight 8 is here! Download on the App Store today to experience our groundbreaking data-driven Aeronautical Maps. New TFR Alerts help you steer clear of TFRs while inflight and upgrades to Logbook make flight logging even easier and more connected than ever. In addition, major enhancements to ForeFlight on the web make it possible to plan, file, and brief whenever and wherever it is most convenient. Read more about web updates here. Fast, powerful, and beautiful, ForeFlight Aeronautical Maps represent the next generation of mapping technology. Rather than using scans of paper charts, Aeronautical Maps are driven by data, opening up a huge range of possibilities for how information is displayed on the map. In the Map Settings menu, new ForeFlight Map controls allow you to select from Light and Dark map themes and to turn the Terrain layer on or off. You will also see new Aeronautical Map Settings when the Aeronautical layer is selected in the Maps dropdown. The ability to customize the map is made possible by ForeFlight’s data-driven map technology. You can turn airspace on or off, set airways to High, Low, or Off, turn ARTCC boundaries on or off, and more. Use the text slider to adjust label text size for better readability. This set of controls for the Aeronautical Map is the first iteration of the choices you will have over what map elements you show or hide—future updates will bring more capability. New Aeronautical Map Settings give you control over what map elements to show or hide. In addition, Continuous Zoom™ and dynamic decluttering of map elements allows you to find useful information at any zoom level, and “always-up” labels make it easy to read text on the map no matter how it’s oriented. A new feature called Smart Airway Labels provides information about segments of any airway in your flight plan. These labels start out small – only showing the name of the airway – but expand as you zoom in, showing additional information about the airway segment like magnetic heading and the MEA. We’ve also taken our Plates on Maps feature to a new level by directly integrating ForeFlight’s airport diagrams into the Aeronautical layer. Zoom in on an airport and runways and taxiways materialize right on the map, complete with labels and FBO markers. 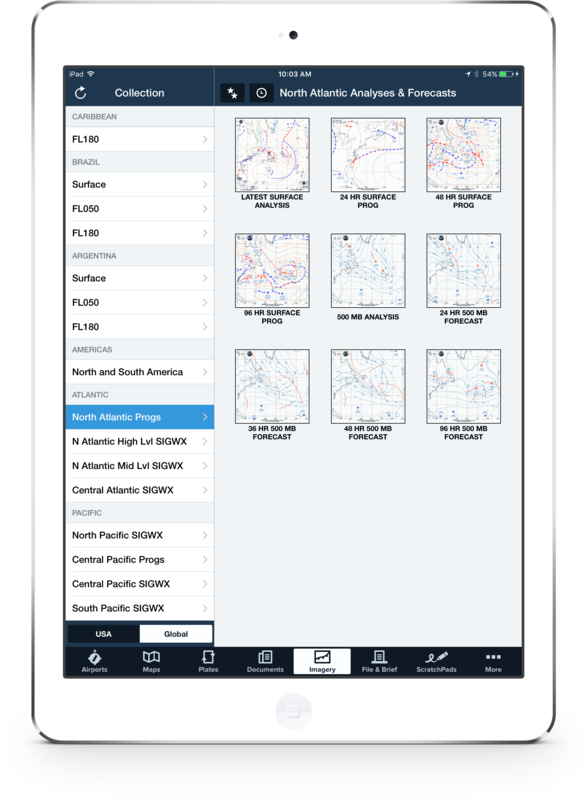 ForeFlight Aeronautical Maps are available with Basic Plus, Pro Plus, and Business Pro plans. ForeFlight 8 adds a new feature to Logbook that busy CFIs and flight students might find useful – Remote Signing. Students can send draft logbook entries to their instructor who can review, send back edits, or sign the entry, whenever and wherever it is most convenient. The instructor can also opt to add the flight to their own logbook as ‘Dual Given’ time. As an added benefit, students take command and learn how to manage their logbook from the beginning. 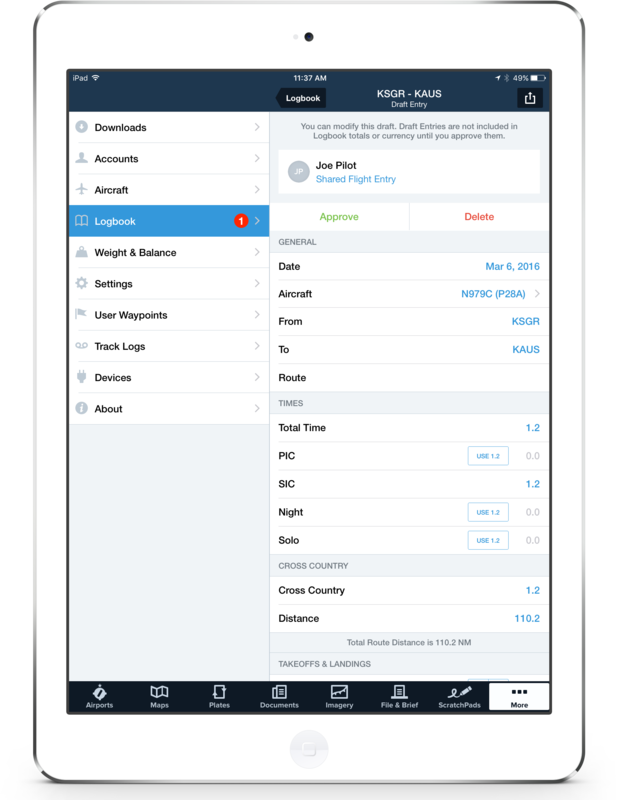 We also introduce Logbook Connect, an ecosystem of third-party services that you can connect to your ForeFlight Logbook. Logbook Connect makes it easier to add flight entries directly from the other pilot services you use. Our launch partners, Redbird Flight and Schedule Pointe, allow you to send draft entries from their respective dashboards to your own logbook. Sharing flights with friends and followers on social media is easy! In addition, Logbook Progress Reports are available to help student pilots track the progress of accumulated flight time towards their PPL or Instrument rating. Finally, sharing flight entries with your friends and followers on Twitter and Facebook is really easy. Simply tap the send-to button in an entry and ForeFlight will create a template post, along with photo attachments. ForeFlight Logbook is bundled with our Basic Plus and Pro Plus plans. The new alerts watch for active TFRs near your current altitude and provide visual and auditory warnings as you approach, and again if you enter one. The alerts work whether or not the TFR layer is selected on the Maps view. 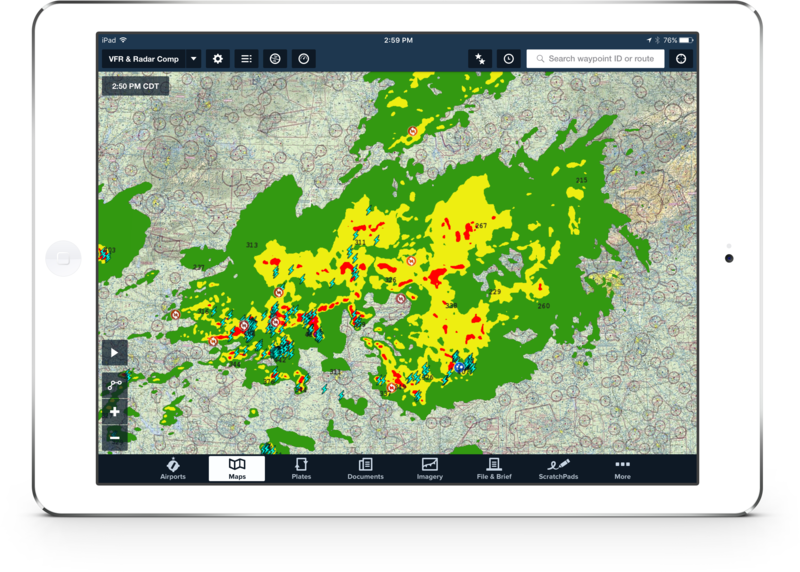 In conjunction with ForeFlight 8, ForeFlight on the web features a number of updates that are now available for ForeFlight subscribers, including the ability to file flight plans, generate weather briefings, and manage aircraft profiles. You can also access and plan flights with our new global Aeronautical Maps. Log in to ForeFlight anytime using your ForeFlight Mobile credentials and access ForeFlight’s powerful flight planning from your desktop computer. Read more about updates to ForeFlight on the web in this article. We’ve recently added some new features to ForeFlight Web that enhance its usefulness for flight planning. The airport popup now closely mirrors the airport popup in the ForeFlight Mobile Maps view, including tabs along the bottom for general airport information, the current METAR, forecast products, and winds aloft. 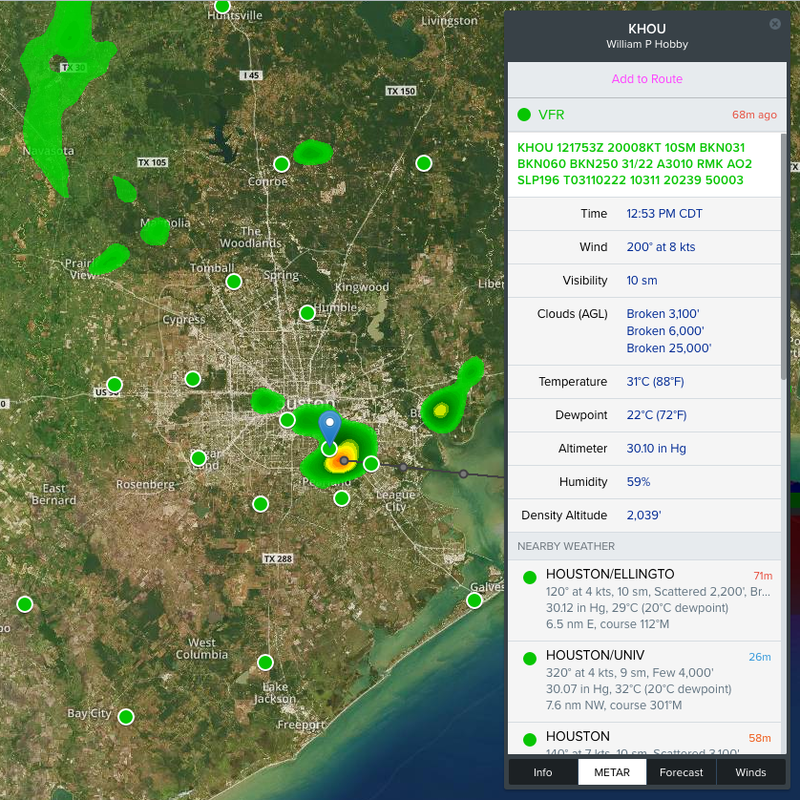 Use the buttons along the bottom of the popup to view information about an airport, forecasts, and winds aloft. From the Info tab you can find lists of frequencies, runway information (including wind components), and links to taxi charts and procedure plates that can be viewed directly in your browser. Links to outside resources like Google Maps and flight tracking through FlightAware are also available. The forecast tab includes TAFs, MOS, and recent area forecast discussions. All this information can be accessed simply by clicking on a weather overlay marker for an airport, or by searching for that airport in the Search bar. The airport popup also includes an Add to Route button for easy “click planning”. With departure and destination points entered into your Navlog, you can then click on the route line to rubber-band it to intermediate waypoints and airports, just like touch planning in the ForeFlight app. Intermediate waypoints can be added to your route just like in the app – drag your route line to the desired location, then drop it and select an item from the list. 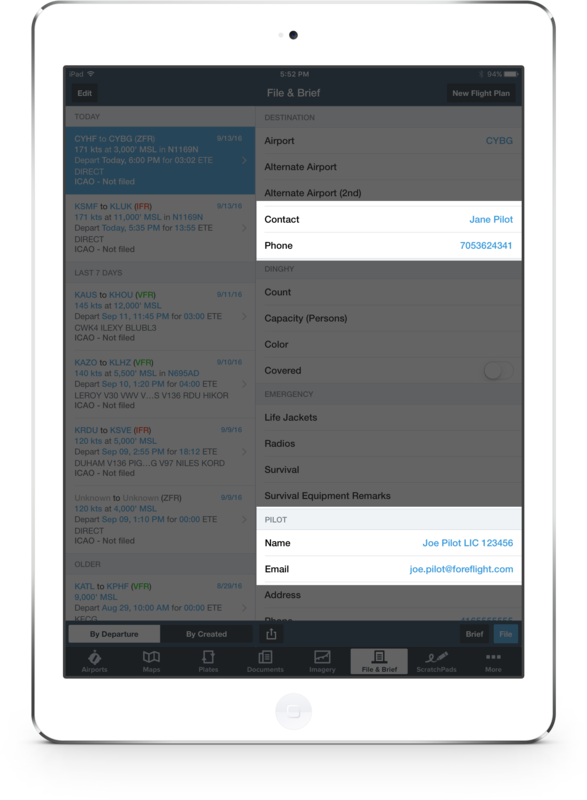 After building your route on ForeFlight web, it automatically syncs to the app on your iPad and iPhone. You can find the route in ForeFlight Mobile in the Recent routes list, or in Favorites if you saved the route.